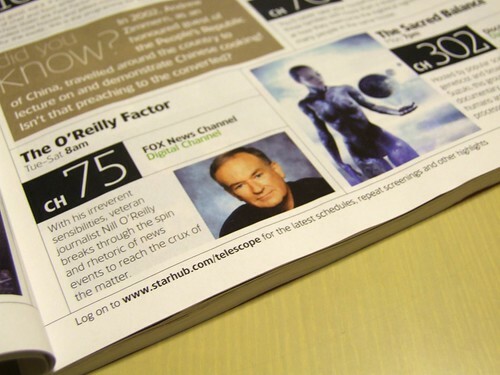 Rubenerd: Singapore magazine misspells Bill O’Reilly! Singapore magazine misspells Bill O’Reilly! I finally caved and re-registered my Pro Flickr account. My experiment with Zooomr was fun, but Flickr is way more reliable and still easier to use. The smart sets feature in Zooomr which can create sets automatically based on tags is nice, but often backfired so I couldn't use it seriously. So to celebrate my return to the Flickr realm, I've posted a VERY funny picture in the Singapore StarHub cable TV guide for this month! That's right, they called him NILL O'Reilly! He's nothing, his opinions are worthless, he's NILL! If you don't have the pleasure of knowing who Bill O'Reilly is, he's a self confessed "traditionalist" who tries to seek the truth "without spin" but is in reality a loud conservative pundit who yanks the microphones – and screams over the top of – people he disagrees with. Very entertaining television if you don't take him seriously. But now he's being shown in Singapore? Argh where's Keith Olbermann when you need him?